The roundabouts will give cyclists priority and ensures they will be in the line of sight of drivers whilst exiting the roundabout. 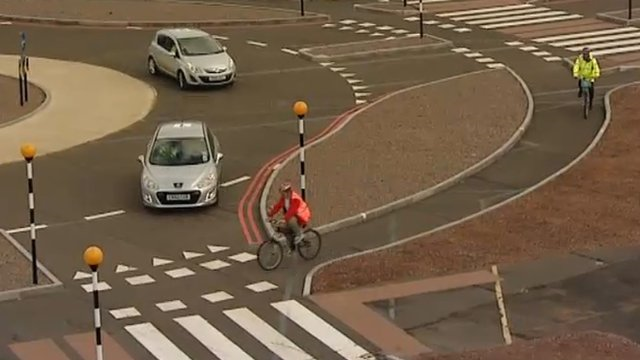 Although the trials of the layout are currently taking place within a research laboratory setting, Andrew Gilligan (London Cycling Commissioner) has said that if the trials continue to go well, they could be rolled out in 2014. Despite not conforming with the regulations within the Department for Transport, the new layout forms part of the Mayor of London&apos;s &apos;Vision for Cycling&apos;. This positive development will be welcomed by campaigners who have recently called for a number of London junctions to be changed to make them safer. The trial has been running for 6 weeks and aims to be concluded in July. The researches will check how the new layout will impact on all users including cyclists, pedestrians and all vehicle types. Other ideas are being studies alongside this layout...such as traffic lights with separate signals for cyclists. Subject to the outcome of the trials, Transport for London will work with the Department for Transport to make these developments a reality.